It’s almost here…the end of 2013! The New Year is on the horizon and I’m looking forward to it! I’ve thoroughly enjoyed the ups of this year and have (hopefully) learned from the downs that it had to teach me. We managed to get ourselves into hosting a no-themed NYE party, as my cousin is calling it, and are having a few close friends over to just celebrate, bond, and reflect over the past 12 months. We may do another wine tasting table and I just wanted to share some quick ideas with you, if you decide you’d like to add one to your party too! Earlier in the month, I did a NYE themed shoot…well before the date so that it could be shared with others in time to actually prepare for the evening. If you missed the post, you may find the full party over at Whimsically Detailed or here. What I did was super easy and super affordable! 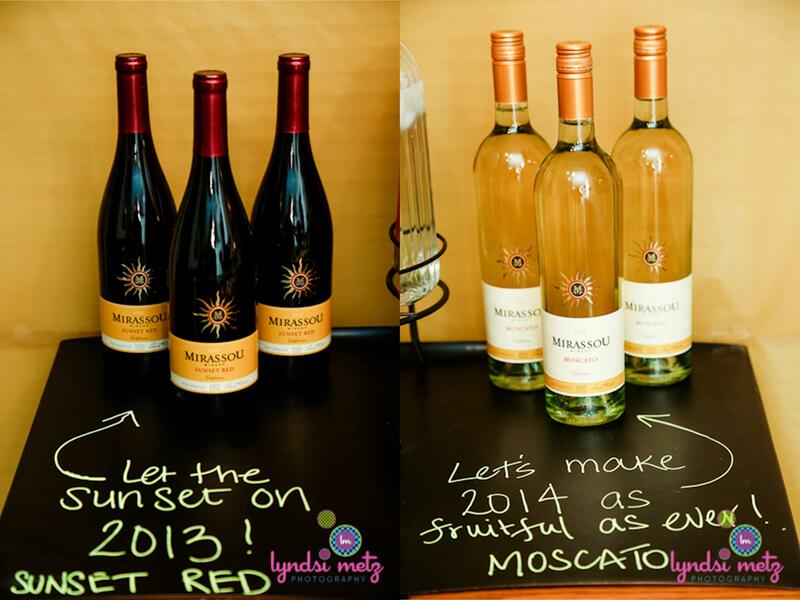 We had wines from Mirassou Winery, the Sunset Red and Moscato, and I picked simple items with which to pair them. The wines average $10 per bottle and you can pick up as many or as few as you’d like. We had a small party, so 3 bottles of each wine were plenty for us, and in the dispensers, I had non-alcoholic punch and water for additional liquid refreshment options. 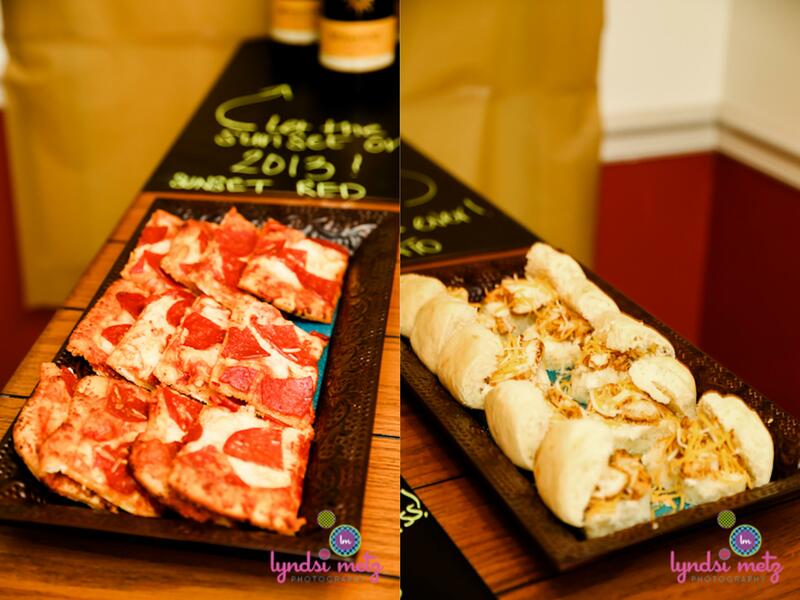 To pair with and bring out the flavors of the wines, I chose pepperoni pizza and sliced chicken sliders. And cubed cheese. Nothing complicated or time consuming at all, this is so quick and easy! I bought a small pizza from the grocery store, baked it, cut it into sample sizes, and served. If you don’t feel like cooking, there is probably a pizza restaurant within 3 miles of you who would be happy to help you out! Want to make it fancy? Cut it into smaller pieces! We also had sliced chicken sliders. Rolls from the grocery freezer, baked, filled with sliced chicken breasts, and topped with shredded cheese. It’s all fancy over here! 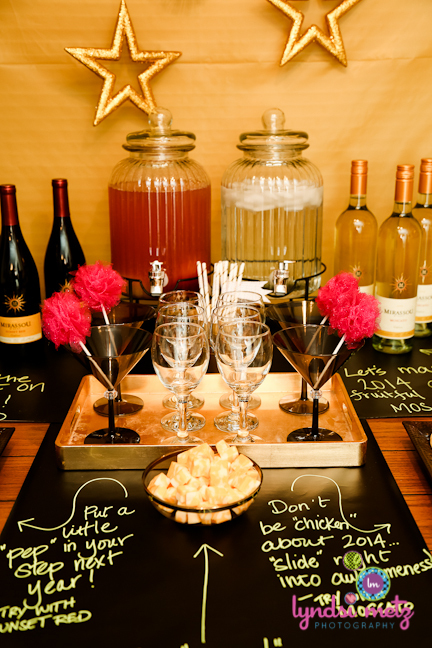 Check out the earlier blog post for other ideas that were incorporated into our party which included the dessert station and popcorn bar. If you want to go all out, Mirassou has all of the tools that you may use to make it happen! You can go to their Facebook page for ideas or go to their website for different wine-infused recipes to pair with the wine(s) of your choice! They even have this really cool tool that will walk you through the pairing, so if you’ve already set your menu, you can just pick the food and the seasoning you used and it will give you recommendations on which wine to use! Check it out here.